One of the first times I met Danny Kahneman was over dinner, just after SuperFreakonomics was published. Shortly after we were introduced, Danny said, “I enjoyed your new book. It will change the future of the world.” I beamed with pride at this compliment. Danny, however, was not done speaking. “It will change the future of the world. And not for the better.” While I’m sure many people would agree with his last sentence, he was the only person who ever said it to my face! If you don’t know the name, Danny Kahneman is the non-economist who has had the greatest influence on economics of any non-economist who ever lived. A psychologist, he’s the only non-economist to win the Nobel Prize in Economics, for his pioneering work in behavioral economics. I don’t think it would be an exaggeration to say that he is among the 50 most influential economic thinkers of all time, and among the ten most influential living economic thinkers. In the years since that dinner with Danny, I’ve gotten to know him quite well. Every time I am with him, he teaches me something. His particular brilliance, I have decided, is being able to see what should be totally obvious, but somehow no one else manages to notice until he points it out. 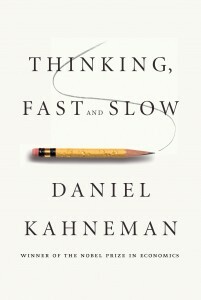 He has a fantastic new book aimed at a popular audience entitled Thinking, Fast and Slow. It is a wonderfully engaging stroll through the world of behavioral economics – the kind of book people are going to be talking about for a long, long time. Now that we understand reason as being largely unconscious, motivated by emotion, embodied and constituted by many biases and heuristics, where do you see the future of cognitive science going? Are we at the beginning stages of a paradigm shift? Damn, now you made me want to buy and read the book. This might damage my personal economy. I've read a fair bit of your journal articles (particularly the ones covering intuition) and while I don't necessarily agree with everything you say (a fair amount of it, though), I think you make very clear, concise, and well-supported arguments. Recently, I've been steeping myself in the "Integral Theory" literature. One of the books I've been reading on the topic discusses the different levels of thinking at the different "stages" of thinking on the spiral [spiral dynamics]. I haven't yet had the chance to read this book (still waiting for it to come in at the local bookstore), but I'm curious as to where you see this book as it relates to the levels of thinking on the spiral . Maybe more importantly, as a precursor, what are your thoughts/feelings on "Integral Theory" and its implications to academic disciplines (psychology, economics, etc.) other than its own? As you found, humans will take huge, irrational risks to avoid taking a loss. Couldn't that explain why so many Penn State administrators took the huge risk of not disclosing a sexual assault? Is Prospect Theory challenged by how investors are behaving actually on european govi bonds ? Investors seems to prefer a sure loss of investing in German Bunds, that carry a sure negative real yield, instead of PIGS countries bonds (p.e. Italy), with a positive real yields and a possible-but not sure-loss. The mathematician John Nash was vastly more influential than Kahneman on economics. Well, saying that he's the most influential non-economist is just an opinion. However, to say that he's the only non-economist to have won a Nobel in economics is a stretch. Herbert Simon's degrees were in PoliSci, and he never held a position in a department of economics. He was certainly influential in economics, but at the time of his Nobel, many (e.g., Friedman) didn't see him as a proper economist. Much like Kahneman, actually. Sometimes, the most influential changes have to some from the outside. I have been thinking about what I call "consumption traps" since I was a kid in the early 90s. I think a huge number of people in the US over-consume optional goods to the point where it has drastically negative impacts on their life prospects. Why would they do this? My theory is that they fall (or marketers push them ) into "consumption traps". In college I discovered that behavioral economics was ferreting a lot of these inefficiencies in "homo economicus" in the 80s. One I have long speculated about is something like "sticky expectations". It seems that some modern consumer goods (particularly electronics) are improving at a rate that drastically outstrips people's ability to psychologically adjust. Today's Ipod would have been worth $10,000 or more as a consumer good 10 years ago. I am still partially psychologically identical with the person who lived in that time. So when I go out and drop $150 on an Ipod I cannot really afford I feel a lot better about the decision than I normally would because in my mind some of that residual $10,000 valuation remains. So it activates some of the "this is a tremendous deal, act now" circuitry in my brain even though it is not, at present, actually a deal. On the other hand perhaps people have always been this prone to over-consumption and thus "this increasing rate of improvement in goods effect" is a theory explaining a phenomenon that doesn't exist. I haven't yet encountered anything regarding this. Are you familiar with any studies/research on the topic? Problems in healthcare quality may be getting worse before they get better and there are countless difficult decisions that will have to be made to ensure long-term system improvement...but on a daily basis doctors and nurses and patients are each making a variety of decision that shape healthcare on a smaller but more tangible level. How can the essence of Thinking, Fast and Slow be extracted and applied to the individual decisions that patients and providers make so that the quality of healthcare is optimized? With the launch of Siri and a stated aim to be to use the data collected to improve the performance of its AI, should we expect these types of quasi-intelligences to develop the same behavioural foibles that we exhibit, or should we expect something completely different? And if something different, would that something be more likely to reflect the old 'rational' assumptions of behaviour , or some totally other emergent set of biases and quirks based on its own underlying architecture? So of course there's been a whole slew of research showing that we are quite irrational and prone to errors in our thinking. Have there been research to help us be more rational? Out of curiosity why did you think that Freakonomics would change the world for the worst? In analyzing where our intuitions may lead us astray it seems to be part of an intellectual movement you and Tversky in many ways began. Also, in my life, I have found that reason and logic to be the best tools in making my life better, but I supplement with intuition when it comes to trusting people and love. Are there examples of decisions where we should trust our intuition more than our reasoning mind? Professor Kahneman, i would like to know your opinion on the relation between pleasure, utility and happiness. Is it posible that the maximization of expected utilty (estimated upon the recall of past utility) did lead to a different outcome than the maximization of happiness? What about the maximization of pleasure?? What do you think about "Fast and Slow Thinking" being released the day before your book, by Karl Daniels (a name which bears similarities to your own)? What did you mean about the Freakonomics changing the world in a bad way. have u applied the 'focusing illusion' concept to voting?- viz. might it be an explanation for What's the Matter With Kansas?, i.e. that voters may ratify a political platform that goes against their interests because of abortion legislation, etc. Suppose I'm the Chief Academic Officer at a University and find the number of first-year students who fail academically to be higher than I would expect (after all, their applications and credentials looked like they could do college level work when they were admitted). How can the ideas in the book be applied to improving student learning in college? It would be interesting to hear your perspective on the rationality of sovereigns as it relates to the people that live in the sovereign. Specifically, in the Euro case, governments just as irrational as the people they govern? It would seem there is a parallel here as well as of late with the crisis. What part of Superfreakonomics did you not like? I'm betting it was the climate change section. Why did you not like it? Is it another case of your bias in finding hubris in others? I'm a graduate student in the Humanities (but with an undergraduate training in the sciences), and I often employ research from the science of the mind (including your work) in my papers and theses. I find there is a lot of resistance to the idea of heuristics and biases that function on such an automatic or biological level, but not because my professors and colleagues believe man is rational- in fact they buy fully into the idea that man is irrational, but only seem comfortable with cultural explanations. Personally, I try to take both culture and biology into account, as well as recognize that both feed into each other. From your experience, what is a good, yet polite, way to help intelligent people who are resistant to scientific ideas recognize the value of such insights into the mind's automatic workings?